We Return, But to a Frozen City-. 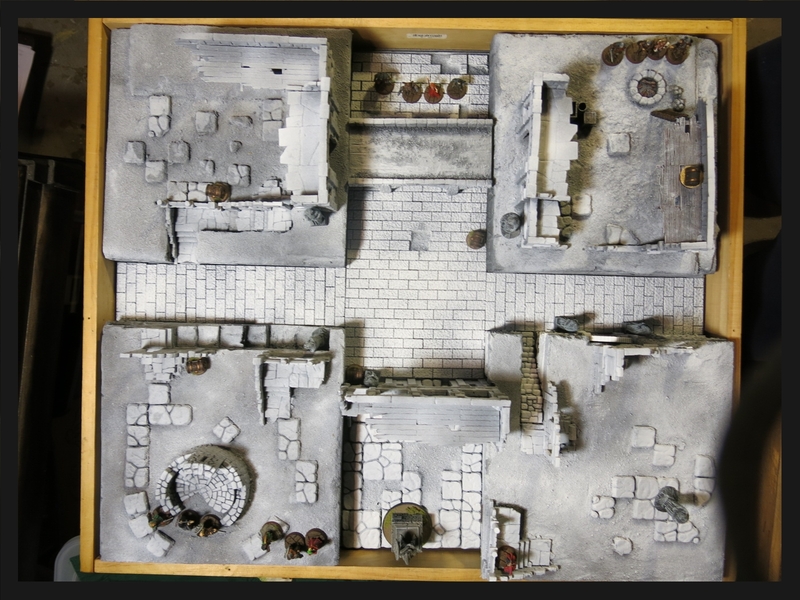 Frostgrave. After roughly 3 months away I hope I am back to gaming and blogging a little more regularly. Our recent move was substantial and difficult. After a couple months of remodeling the new house, while getting the old place ready for closing, and then moving (without movers mind you did it all myself with some family help from my brother in law and his businesses 16ft truck) was a bear. Add to that, working and having two young kids in a beach town in the middle of summer in my “spare” time , left me no room for anything else but sleep. While I say 3 months its more like 6. Other then Adepticon and handful of Bolt Action and SAGA games this year has been a total wash for the hobby. While I have Operation Sting ( a now, Bolt Action tournament) which features nearly all my favorite Chicagoland gamer pals coming up in about 6 weeks, my Army for that is done minus a few weeknights of touch ups and display work. Somewhere along the way during late night web surfing, I came along the game Frostgrave Despite my years of big army gaming, I am a skirmish player at heart and a skirmish game this popular using any generic figures seemed right up my alley. A quick Amazon order later I was digging thru the rulebook and realizing this was very easy game to to play. I like the mechanics a lot better than Songs of Blades and Heroes and with a Mordheim style campaign and interest from my almost 9 year old daughter in full effect, we set out to playing a game. First of all, we needed a board, something small , as I am probably year away for unpacking and organizing all my Hobby stuff, things like my sprawling Hirst Dungeon seemed to cumbersome for this at the moment, so I saw my built but not painted pile of Osgilath GW terrain sticking out of a box and said Osgilath?/ Frostgrave!. Perfect. 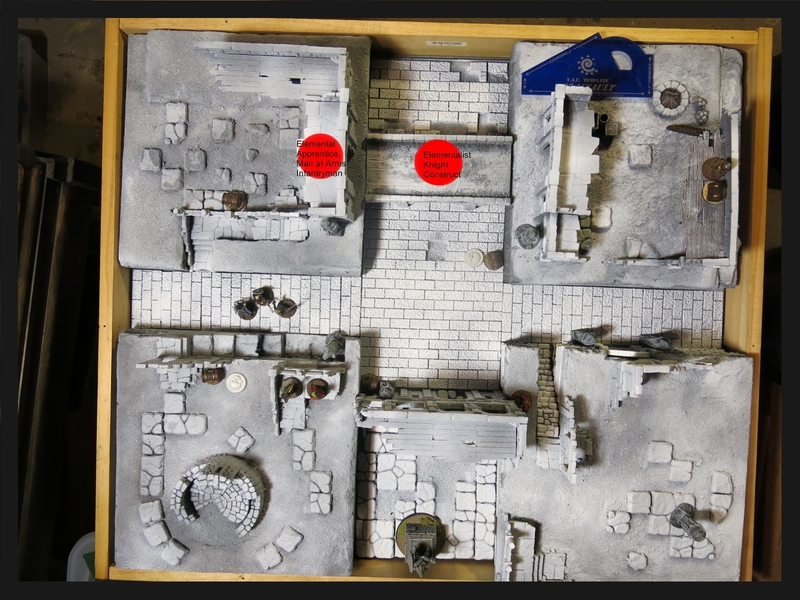 With some foam insulation, some Hirst left overs I had cast forever ago and 12 or so free hours over the course of the week - we had our first section of the Frostgrave city. back row: Infantyman, Crossbowman, Man At Arms, Thief. Elementalists spells: Elemental Ball, Bolt and Shield Animate Construct, Fast Act, Heal, Write Scroll and Bind Demon. Note on Spells: first time thru with a campaign in mind we went for a good balance of in/out game spells I had my daughter specifically take Bind Demon as I was a Demonologist and I also had her cast Animate Construct before game so she could add the construct to her warband. Elementalist team in two groups of 4 on Northside of table. Summomer is 3 groups on Southside. Optional games rules in play: "wounded". "critical hits" "creature spawning"
Elementalist: My Daughters Elementalist uses group activation and moves her wizard, knight, Construct and Thief up to within sight and nearby reach of 2 Treasure tokens. The Thief with his 10.5 double move is just about on the nearest. Summoner: I use a group activation – Moving Demonologist Jr., my Barbarian and Archer all move 9 inches. My Barbarian touches treasure nearest token , but I read the rules on carrying treasure and decide to leave it for now. Summoner: Remaining infantry moves x 2 . 9 inches. Elementalist: All previously moved via group activations. Turn 2 begins and it gets hot and heavy right away..
Elementalist: Activates by herself as she wants to cast a spell first so she cant group activate (Group activate requires movement action or sacrifice of , First.) She casts Elemental Bolt at my Barbarian who I left totally in the open Casting roll is a 19 to hit (oof) , it’s a crushing +8 shooting attack. She rolls an 16 +8 for 24!..my defense roll is a weak 13, I am hit. the successful 24 roll versus my Barbarians horrible armor of 10 ..means I take 14 points of damage ! and my best fighter Barbarian is immediately out of action at the start of round 2. The Elementalist drops back under cover of bridge. My daughter says I like this game! Summoner : Moves 6 casts the spell Grenade at Knight and Construct who haven’t activated yet. I rolls a 13! I need a 14 since it’s a spell from a Neutral School , I burn 1 health to empower the spell and succeed. "Grenade" is +3 shooting attack on both I roll Roll 18 +3 = 21 to hit Knight rolls 15 +5 (Fight 4 +1 modifier as I moved for 20! He almost escapes but doesn’t.. I wound for 21-13 armor = 8 damage .Construct rolls 18 to defend but F+1 and +1 modifier as I moved for 20 vs 21 again 21-12= 9 damage.. Both almost escape but luck was on ourside Grenade becomes the go to spell of the game for the Summoners. Elemental Apprentice : Group activation runs across bridge toward other Treasure Token and hard cover. Summoner Apprentice: Group activation himself and Archer. No movement for either considering his nice vantage point with cover. He also casts Grenade at the now wounded Knight and Construct and rolls a 15! He needs a 16 due Apprentices being an additional -2 to cast , as they are Apprentices. He also burns 1 health to empower the spell to succeed. I roll the first natural 20- a critical hit vs Thief 15 defense total . He does stand a chance and goes down hard with 24 damage. 20+2 -10armor = 12 x 2..
Summoner: My 3 Infantrymen see the advantage and move on the double.. toward the Elemental Apprentice and another Treasure Token. 6 of the Elementalists figures are under cover in this picture. the Elemental Apprentices postion is extremely important considering the epicness happening in the upcoming Turn 3. Elementalist: Activates by herself again solo to cast Heal on the Knight rolls 11 Needs a 12 as ita an aligned school . So burns 1 health to and Heals the Knight for 5 points. Moves to another covered position under bridge withing range of Treasure Token where Thief fell. Summoner: Casts Summon Demon again with a second attempt rolls a 15! and then a 12 for a minor demon.. whose is planted 1 inch from him. Elemental apprentice: activates.moves up thru cover of doorway and and casts "Elemental ball" at approaching infantry she rolls a lucky 15 on the casting roll and then a super lucky 19 to hit!! (oof again I am getting creamed here ) Elemental Ball is a +5 Shooting attack that hits all three. My daughter: I really like this game!!!!! Take that I say!.. my daughter frowns. My Archer moves and picks up Treasure token near fallen barbarian..
creatures spawn. She rolls a couple of Ice Spiders that come in near where her Apprentice fell she's not happy. Her crossbowman takes a shot at the demon..but misses with a 4..
Knight stays to guard wizard….but the damaged Construct moves in range to but does not engage demon buying some time ( the construct isnt human some altough its has 3 hits left we dont use the wounded rule on it. Infantry and MaA move and secure another Treasure token. Creature Phase: Ice spiders move double and engage Elementalist Man at Arms. forcing combat. There are not activiations left so the turn ends. My Infantry thinking they where going to get to go this turn before they all got blown to hell courtesy of Elemental Ball. Demon Summoning is fun, for the moment. Construct moving up to feed itself to the Demon, but it won the first buying valuable time for the Elementalist. .Demons Rolls a 15 to resist +4 will to a 19, nope Demon switches sides…Shes much better looking Ok the party is over for Summoners I think. Summoner: looking thru my spells, I see Teleport which seems key right now. I need a 14 rolls..and I roll a 14…unlike just about everyother games Wizards in this game can fight well in Melee (Gandalf style) I zap across the board and move into combat with crossbowman whose holding a treasure token. Demon takes 3 damage, The Construct is destroyed.. The Crossbowman is holding a Treasure Token when engaged by summoner wizard in melee so -1 fight She rolls a 3 versus My Wizards 11 I win but only do 2 damage. 13 vs armor 11 = 2 damage… I can push her over ledge but the fall is only 4 inches not enough to kill her and she still has the Treasure Token so I choose remain in combat . Hoping for 1 more round. Man at Arms vs two Ice Spiders, Infantry man drops Treasure Tokens a and engages one spider making the fight making 2 1 vs 1.combats. Man at Arms rolls a 19 vs 7 for spider…killing it..
Infantryman rolls a 5 vs spiders 15 takes 4 damage and is wounded by spider venom.. The Knight uses move to climb up the bridge to try to stop the my Wizard from killing the Crossbowman from stealing the Treasure Token. Summoner: My Wizard continues the melee against the Crossbowman rolls a 19 vs 13 or 21 vs 14 wins and 10 points of damage Crossbowman is Out of Action I .pick up the Treasure Token as my movement..
Knight moves double, 7.5 inches toward my wizard to intercept..
Summoner apprentice: When you're hot your hot, I keep pushing my like with "Grenade" and thrown another hail mary at the demon..I roll another 14 and burn 2 more health to make it work. I'm at 5 hits anymore and I am wounded and only have 1 activation and other penalties. Shooting Roll is 15 +3 = 18 vs the Demons 17! (17 +0) …He wins barely . 18 versus 11 armor= 7 damage…kills demon!!. He moves toward chest..6 inches..
leaves board securing the Treasure Token. The multiple Teleport spells to the platform where the chest is and back toward the statue proved key to victory. Elementalist: Casts Elemental Bolt at Summoner Apprentice…fails rolling a 2,… taking 2 damage.. from Spell Failure. as if that a cue moves with Treasure Token toward board edge..
Summoner: Casts Teleport again rolls a 15…! Moves to far board edge..see you later Mr. Knight. Summoner Apprentice:. picks up Treasure Token rolls a Creature check! 17!! fails and an Armored skeleton appears at the same point the Ice Spiders did…not relevant this late in the game. All leave the board..one Treasure Token secured..
Summoner Soldiers: All out of play or off board. Creature Phase: Armored Skeleton moves random direction. Elementalist: Leaves the board with a Treasure Token secured. Summoner Apprentice only figure on board and has a Treasure Token secured. Elementalist: One Casualty , The Thief, who took an Arrow in the face for 24 damage. good treasure for just two rolls. Remaining Campaign actions, Bases, exp upgrades etc to be determined before next game. Hectic back and forth, hot dice and pure luck pulled it off for the Summoning team. the way the game shook out just didnt give us a deep look at Melee combat or alot of different spells as we kept relying on the same ones. I can see alot of tactical play being required here, especially with the use of cheap troops that we will make sure to take more advantage of moving ahead. Frostgrave is definitely another easy to learn , hard to master type of game, especially against skilled opponents. The D20 add another layer of randomness which I like better than D6 at this point, We look forward to playing again and my other daughter wants to play so we will see As for now Osprey Games -Frostgrave gets two thumbs up!.